What is the decision rule for NPV? When the NPV is greater than zero, the investment/project being considered is projected add value to the company. 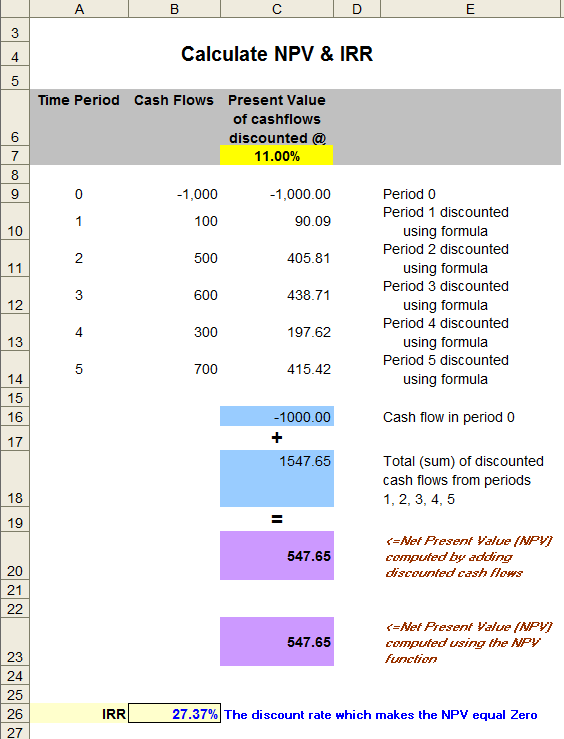 NPV (Net Present Value) measures the time value of money. 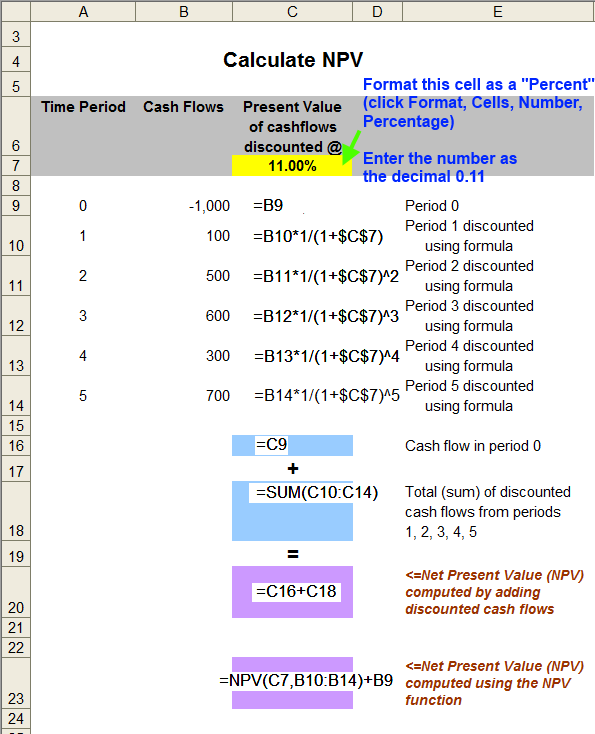 It is the net present value of all future cash flows for a particular investment. 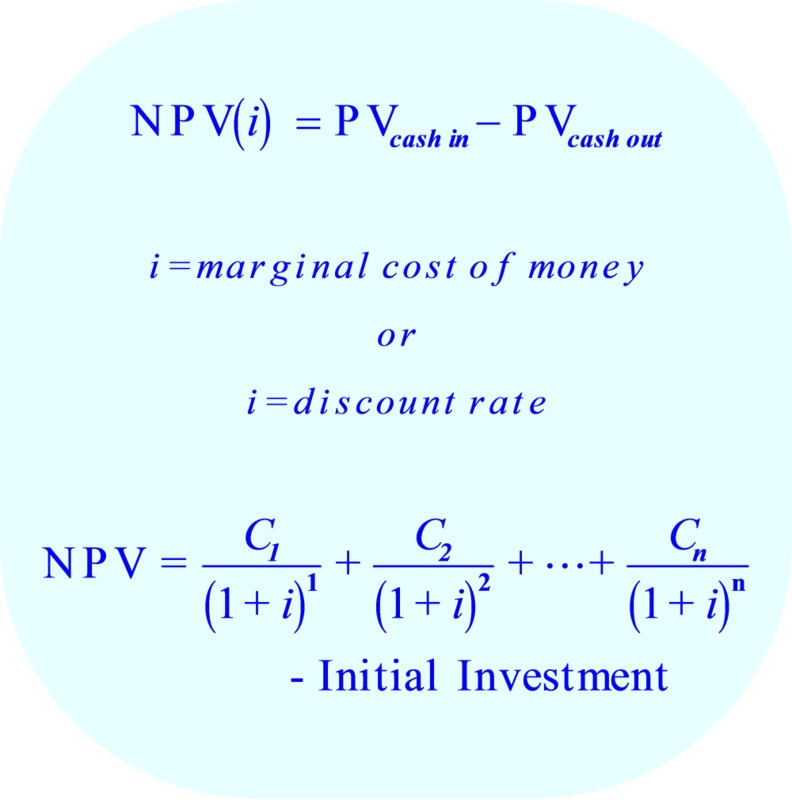 The NPV is the PV (present value) of all cash inflows minus the PV of all cash outflows. Because of this, the NPV is called a "difference amount". 1. using a financial calculator. 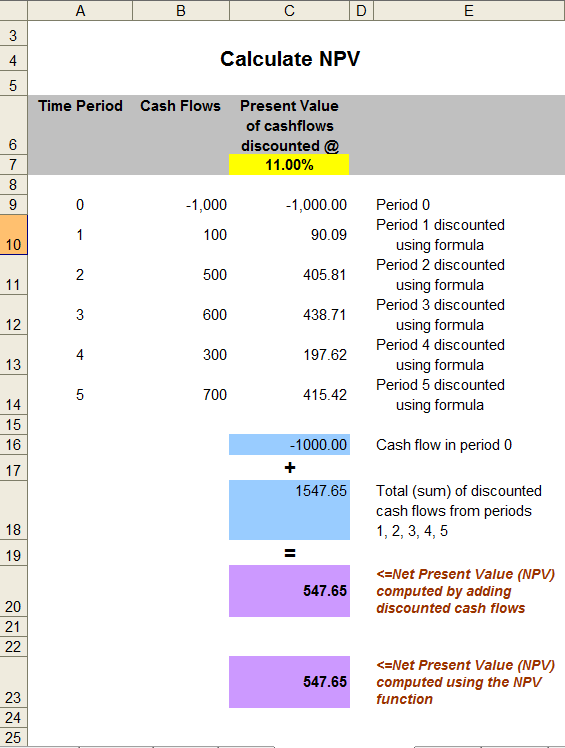 2. using the NPV formula (shown above in blue) with an Excel spread sheet. 3. using the built in NPV function in an Excel spread sheet. These values can be entered into an Excel spread sheet as shown below. Regardless of whether the NPV is calculated using the general formula for NPV, or using the built-in Excel function, the result is the same. The ARR (Average Accounting Return) can also be used to evaluate projects being considered. However, it is should be noted that the ARR is not a true rate of return because is does not take the time value of money into account. ARR_1 = the average annual accounting profit during the years of the investment, divided by the initial investment. 2) using the average book value of the investment. ARR_2 = the average annual accounting profit during the years of the investment, divided by the average book value of the investment. The average book value of the investment is the sum of the initial book value of the investment and the final book value of the investment, divided by 2. When a company uses the ARR to evaluate a project, the general rule of thumb is to accept the project if the ARR is greater than a target rate (or goal). The IRR (internal rate of return) is widely used to evaluate investments being considered. The IRR (internal rate of return) can be thought of as a break even interest rate. The IRR is the interest rate where the NPR equals zero. Internal rate of return (IRR) is the interest rate at which the net present value of all the cash flows (both positive and negative) from a project or investment equal zero. 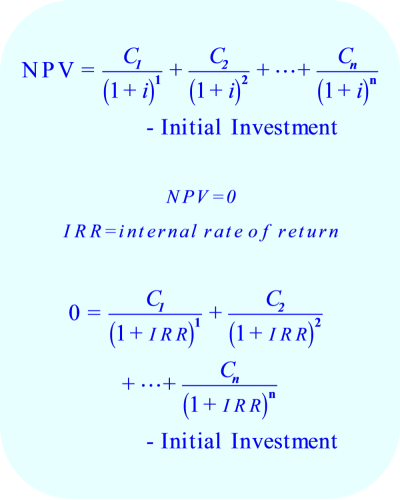 The IRR is calculated using exactly the same equation as the NPV. Instead of using a known interest rate and solving for the NPV, the NPV (left side of the equation) is set to equal zero. The interest rate (IRR) is the unknown value. The IRR is difficult to calculate by hand because the equation is solved by iteration (trial and error). However, the IRR can be calculated using a financial calculator or the built-in function "IRR" provided by Microsoft Excel. The IRR calculation is convenient, but does have some major shortcomings. Beware of the fact that the IRR is the solution to a polynomial equation. When the future anticipated cash flows change signs more than once over the time periods being considered, the calculation of the IRR will yield two or more solutions. The IRR does not measure the size of the return, or the size of the initial investment. The IRR for an investment of $7 which returns $21 will be high. The IRR for an investment of $250,000 which returns $500,000 will not be as high. However, the $250,000 investment is the better of the two. The IRR can't compare projects with differing life spans. The IRR does not take the cost of capital into account.